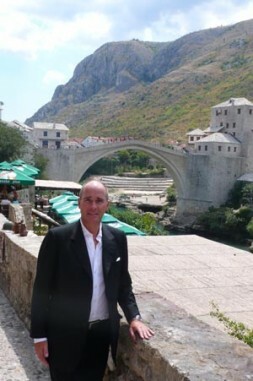 Dr. Hubertus Hoffmann, President and Founder of the World Security Network, at the famous bridge in Mostar in Bosnia-Herzegovina: "In Mostar, 5,000 buildings were destroyed and 2,000 citizens killed during the brutal period of fighting from 1992 to 1995. Many of the fallen young men are buried in the city. Twenty-six thousand citizens fled." The famous old bridge of Mostar, built by the Ottoman Empire in 1566 and extending across the turquoise blue Neretva river, stands once again. This structure, now honored as a World Heritage Site by UNESCO, was destroyed during the civil war . It was rebuilt and possesses great symbolic character. The bridge captivates the eye through its gracefully curved form, connecting the old, minaret studded Moslem area of the city with the catholic Croatian part across the river, dominated by a large cross above the mountain and the church. In Mostar, 5,000 buildings were destroyed and 2,000 citizens killed during the brutal period of fighting from 1992 to 1995. Many of the fallen young men are buried in the city. Twenty-six thousand citizens fled. The pockmarks of the war remain in several areas. On the whole, however, Mostar impresses with new signs of reconstruction, lovely shops by international designers and a fresh, new young generation. Serb communist dictator Slobodan Milosovic, with the active help of local Serb leaders like the President of the Republika Srpski Radovan Karadzic and his Chief of General Staff Ratko Mladic, systematically expelled the Moslem population from Bosnia, isolating them in enclaves and – under the eyes of Dutch UN forces in a UN “Safe Area” executed more than 7,000 men in Srebrenica. The two murderers from Bosnia are still protected by Serbian nationalists even though wanted for war crimes by the UN. To end the killings, and please UN Security Council veto wielder Russia, the Dayton Peace Accords of November 1995 set down a maximum of localization and regionalization in the present state of Bosnia-Herzegovina; perhaps a rough model for a new peace structure in ethnically-based conflicts such as those in Iraq and Afghanistan. The central government has a minimal, and in practice, primarily formal representational authority with respect to foreign relations, and a minimum of power in the interior. A maximum of autonomy is granted to the many national puzzle pieces within the country. Three population groups consisting of Bosnians (48%), Serbians (37%) and Croatians (15%), who were bitter enemies during the 1990s, separated themselves after the war and now comprise far-reaching autonomous cantons under a weak central government in Sarajevo. The cantons are responsible for everything in their area, in particular for education, law enforcement and health care. The mainly independent Serbian Republika Srpska, which makes up one third of the population, stands as a bulwark of the Serbian population in the territory of Bosnia-Herzegovina and resists any further merging of the police, education and health care in the political center Sarajevo vehemently. This Balkan nation, with its 4.5 million inhabitants, has reached peace through an atomization of state power and separation of the three population groups. The murder and destruction of war was extinguished in the Dayton Peace Accords through maximized regionalization and the invitation of a multinational military Implementation Force, the IFOR: 60,000 troops under the command of NATO and with a UN mandate. The agreement retained Bosnia and Herzegovina’s international boundaries, created a joint multi-ethnic and democratic government, but below a second tier of government comprised of two entities equal in size: the Bosniak/Croat Federation of Bosnia and Herzegovina and the Bosnian Serb-led Republika Srpska. The Office of the High Representative (OHR) oversees all civilian aspects of the government. First IFOR, later a smaller SFOR and since 2004 European peacekeeping troops (EUFOR) maintain peace and now want to leave step by step. The hot coals of the war have thus been cooled. Commonalities are very limited. One group lives alongside the other. Reconciliation remains a tender sprout. Bosnia-Herzegovina has won a state of non-war—an unbelievably important and positive step. Yet true peace has not yet been found. The next phase of reconciliation, coming to terms with the past and connecting with the centuries-old example of peaceful coexistence, must now follow. 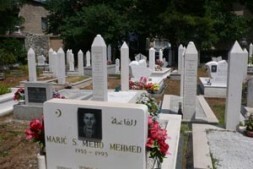 "Only 12 years ago, Bosnia was the center of the largest genocide in Europe after Adolf Hitler. (see details in http://www.bhline.info/genocide/)"
This Balkan nation desires genuine reconciliation and a transition to a new, true peace. It contains the largest Moslem population on European soil, with long-standing connections to Turkey from a shared history during the Ottoman Empire, and is also a laboratory for a possible, peaceful coexistence between Moslems, Orthodox Christians and Catholics worldwide. The second difficult phase on the path to creating peace must begin soon, or frustration among the three population groups will escalate. The American thinker Eric Hoffer spoke wisely when he said that “war is only won after you have turned your enemy into a friend.” The German philosopher Immanuel Kant wrote in his book on eternal peace that “it is not a state of nature. Far more, it must be promoted actively.” This is precisely the problem in The Balkans currently, above all in Bosnia-Herzegovina and in Kosovo, and ultimately in Serbia, Croatia and Slovenia. Unfortunately, most local politicians and religious leaders have failed in this task. Neither the leading politicians of the three factions, nor the Grand Mufti and Ulema of Bosnia and Herzegovina Mustafa Ceric, the Catholic Cardinal of Sarajevo Vinko Puljiic, nor the Orthodox Bishop have begun a joint, progressive, forward-looking and far-reaching policy of reconciliation. This old guard clings to the past and remains in its ideological and political trenches. There is no roadmap for reconciliation with concrete, bold steps, but rather a stubborn defense of the positions set down in the Dayton Accords. A genuine, three-level grand bridge of reconciliation and peace must still be built in Bosnia. "Three population groups consisting of Bosnians (48%), Serbians (37%) and Croatians (15%), who were bitter enemies during the 1990s, separated themselves after the war and now comprise far-reaching autonomous cantons under a weak central government in Sarajevo." Serbia and its traditional ally Russia, with significant power in the UN Security Council, keep the conflicts in Bosnia and also Kosovo going in line with their Machiavellian policy of influence and paralysis. True peace is thus hindered and delayed through their numbing poison—a long-term revenge by Serbian nationalists on the (from their perspective) rebellious peoples of The Balkans. In this respect, Serbia continues to refuse to acknowledge its special and significant historical responsibility, and its moral obligation to compensate for its oppression and murder; for example the mass murder of 7,000 in Srebrenica. Should one continue to wait for a Serbian reconciler in the figure of an Adenauer or a de Gaulle, or for moral politics instead of power politics on the part of the Kremlin? Are not some model European countries such as Greece or Spain not quietly satisfied when separatists experiments such as in Bosnia bog down in difficulties—a daily warning, so to speak, to their own minorities not to buck the central authorities? How should the new, stronger adoptive uncle, namely the European Union, handle its Bosnian foundling? If Eric Hoffer and Immanuel Kant are right, the EU must now, of its own initiative, actively sow the seeds for a genuine reconciliation—if not, the structure of a peaceful Balkans will remain an unfinished construction area and, as in the last century, a source of European instability. Along with the outstanding and positive support in The Balkans provided by the U.S., the EU must now develop and implement a master plan for reconciliation—if necessary even against the resistance of Belgrade and nationalist politicians. Which new elements should be contained in the second phase of reconciliation for Bosnia-Herzegovina and the additional urgent problem of Kosovo? The European Union should produce an Annual Report on the Situation in Bosnia-Herzegovina and in Kosovo in which the progress of reconciliation is recorded and debated. The EU Parliament, in response, could organize annual public hearings. The EU needs to stimulate investment in Bosnia and as well in Kosovo; the unemployment and frustration of the younger generation are main issues of unrest. Serbia's membership of the EU as a reward for surrendering Belgrade’s blocking policies regarding Bosnia-Herzegovina and Kosovo. The main war criminals Karadzic and Mladic must be brought to justice in The Hague now as there will be not true peace without justice. The EU should rely on a new generation of politicians and call into being now a mentoring program for the Serbian, Moslem and Croatian elite in order that the old generation of politicians is replaced as soon as possible by a younger and progressive leadership. 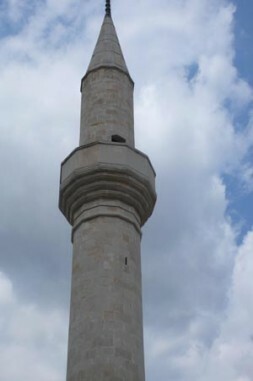 A minaret in Mostar: "If Eric Hoffer and Immanuel Kant are right, the EU must now, of its own initiative, actively sow the seeds for a genuine reconciliation—if not, the structure of a peaceful Balkans will remain an unfinished construction area and, as in the last century, a source of European instability." The institution of Truth and Reconciliation Commissions in Bosnia and Kosovo along the lines of the investigation of the apartheid regime in South Africa with the authority to grant amnesty to the guilty who acknowledge crimes of the past. A joint schoolbook commission of the three population groups. A reconciliation fund financed by the EU and an annual report on the status of reconciliation by the central government in Sarajevo. The naming of a Special Minister for National Reconciliation with his own staff and budget, who would develop and coordinate these measures with the help of EU financing. Several joint working commissions with the participation of the EU, for example, in education, health care and law enforcement. An Annual Day of Reconciliation and remembrance of the victims from all three population groups. These are some conceivable concrete steps, which can be expanded through many thousands of grassroots activities. The Balkans are still not really at peace. The division of the population groups after the war and the atomization of the region has made a non-war possible, which is indeed something after the murders. A true peace must now be won actively now, under the leadership of the EU, and remain securely cemented for hundreds of years like the bridge in Mostar. Ukraine elections 2006: Where next?